Auckland Mayor Phil Goff has signed an agreement with Guangzhou Mayor Wen Guohui and Los Angeles Deputy Mayor Jeff Gorell to extend the alliance between their three cities for another three years. The third and final Tripartite Economic Summit took place in Guangzhou last week. 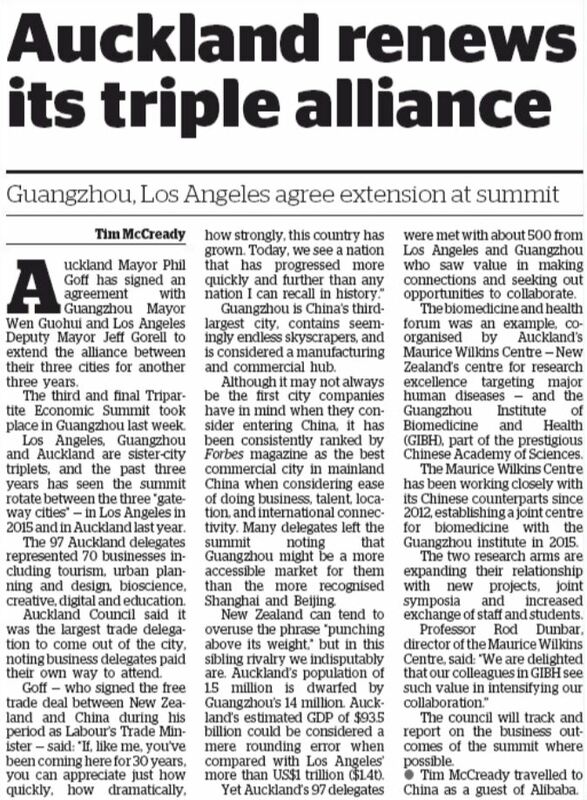 Los Angeles, Guangzhou, and Auckland are sister city triplets, and the past three years has seen the Summit rotate between the three ‘gateway cities’ – previously in Los Angeles in 2015 and Auckland last year. The 97 Auckland delegates represented 70 businesses including tourism, urban planning and design, bioscience, creative, digital and education. Auckland Council says this has been the largest ever trade delegation to come out of the city noting that business delegates all paid their own way to attend. Now, Guangzhou is China’s third largest city, contains seemingly endless skyscrapers, and is considered a manufacturing and commercial hub. Although it may not always be the first city companies have in mind when they consider entering China, it has been consistently ranked as by Forbes magazine as the best commercial city in mainland China when considering ease of doing business, talent, location, and international connectivity. Many delegates left the Summit noting that Guangzhou may be a more accessible market for their business than the more recognised larger markets of Shanghai and Beijing. New Zealand can tend to overuse the phrase “punching above its weight,” but in this sibling rivalry we indisputably are. Auckland’s population of 1.5 million is dwarfed by Guangzhou’s 14 million. Auckland’s estimated GDP of NZ$93.5 billion could be considered a mere rounding error when compared with Los Angeles’ over US$1 trillion. Yet Auckland’s 97 delegates were met with around 500 others from Los Angeles and Guangzhou that saw value in making connections and seeking out opportunities to collaborate. The biomedicine and health forum was an example of these collaborations, co-organised by Auckland’s Maurice Wilkins Centre – New Zealand’s Centre for Research Excellence targeting major human diseases – and the Guangzhou Institute of Biomedicine and Health (GIBH), part of the prestigious Chinese Academy of Sciences. The Maurice Wilkins Centre has been working closely with its Chinese counterparts since 2012, establishing a joint centre for biomedicine with the Guangzhou institute in 2015. The two research arms are now expanding their relationship with new projects, joint symposia in both countries, and increased exchange of staff and students. “GIBH is one of China’s leading biomedical research groups and hosts many world leaders in their fields,” says Professor Rod Dunbar, Director of the Maurice Wilkins Centre. Businesses took part in business matching, sector specific sessions and forums, and a visit to tech giant Huawei’s nearby Shenzhen campus. While New Zealand can be blasé about our mayors and local Councillors, in China they are considered almost like celebrities. It is for that reason that many of the Auckland business delegates considered the high-level representation to have helped connect them to significant players within companies that they would not have otherwise had access to. While the primary aim of the Summit is to build connections for the long-term outcomes that can eventuate, ATEED has said that several companies have made excellent progress at this year’s Summit. The Council will track and report on the business outcomes of the Tripartite Summit where possible. – Tim McCready travelled to China as a guest of Alibaba.